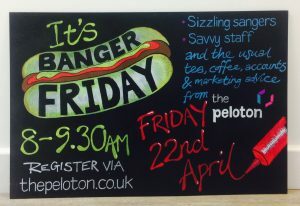 Friday mornings are quite special at the Peloton. Not only is it the last day before a well-earned rest and the team head off to cycle, swim, walk dogs, row, or simply head to the nearest boozer, but most importantly is ‘Banger Sanger’ day. A banger sanger, should you not know, is a sausage sandwich. And frankly there is nothing nicer than the opportunity for all of us to sit down on a Friday morning with a sausage sandwich covered in sauce and a mug of coffee whilst we review the fun and games of the last week. Never one to keep a good thing to ourselves we agreed to put a chalkboard outside offering anyone driving by on a Friday morning to join us for a sausage sandwich. Well, that turned out to be quite a popular event. Several people wandered in and were surprised to see an Accountants office offering food and a hot drink – for free – no catch. But in particular, three guys shuffled in, clearly together but all quite different from one another. Ever the consummate host I asked what they were up to, what were they doing just now? We are starting a brewery. That’s cool, I love beer. I drink loads of it. You are definitely in the right place. How exciting. Rather dismissively they looked back at me, expressionless, and said you are probably thinking about the Traditional Real Ale or macro lager, that the mainstream brewers produce. Clear, flavourless, tap water. OK, so what are you talking about I said, feeling a little crestfallen? I quite like my beer and thought I knew what I was talking about. Little did I know but I was just about to undergo a massive re-education program in what constitutes beer. In fact, craft beer, to be precise. So the education process started. It’s not necessarily about how many pints you can drink, in fact, you don’t drink it in pints. Craft beer is drunk in thirds, or halves, or two thirds. These beers are about massive flavour and a completely and totally different experience (I was about to learn) from drinking High Street beers. What do you call yourselves then? Verdant. Nice, good name. I’d best Google that when I get a minute. Got any plans? Yeah, we’ve run out of space where we are. We are looking to start a new brewery in a 3,500 square foot space. We haven’t been paid since we started. We’ve thrown all the money we have into this project and Richard here has just given up his job to commit fully to the new brewery. OK, good luck with that. Silently I thought, ok, we’ve heard this story before. No cash, loads of passion, little hope. Crash and burn. Fast forward 6 months. Adam comes in. The brewery is up and running. All of Adam’s hair (and trust me, there’s loads of it) is standing bolt upright. He’s looking like he’s either received a massive electric shock or he’s just driven here on a motorbike at 100 mph. What’s up, man? VAT’s due, we need more kit. We’ve got nothing in the bank, but the beer is flying out the door faster than we can produce it. We are rated number one on Untappd. It’s all going nuts. OK, so how is that going to work? You are fast running out of cash, your demand exceeds supply, you need more equipment and you can’t pay the VAT bill. Tense times. But very careful handling of suppliers, banks, VAT men, Postmen, snowmen, in fact, anyone that would listen and they squeezed their way through. 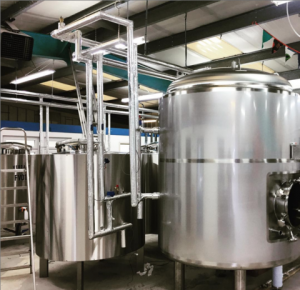 They were very quickly turning into a successful business, but struggling with massive growing pains as one fermentation vessel after another was purchased and squeezed into an already full factory. What started as a cool place with a dedicated tap room, big music system and plenty of room for a table tennis table very quickly became a fully functioning brewery with canning line and barely room to swing a bar towel. They were at maximum capacity and things are looking good. It turns out I’ve learned a lot about craft beer. 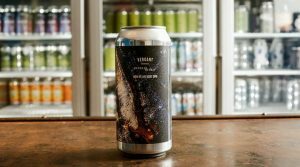 Not only what makes a great craft beer, but also what makes a phenomenally successful craft beer brand and how many of the ‘normal’ rules of business can be thrown to one side when you get the whole recipe for this business right. It wasn’t long before we saw some extraordinary outcomes, backed by huge valuations, arising from crowdfunding campaigns. So in one meeting with the guys, I mischievously suggested how about we go for a raise? Move to bigger premises? Build a new brewery? Well, we thought, if some of these guys could do it, Verdant could do it. Still top three on Untappd, demand outstripping supply at both wholesale and retail. The stones were looking good. Let’s give the Crowd funders a call. And so we did. Mixed feelings here, and careful not to start a massive libel case but chocolate fireguards springs to mind. And here we are, 3 years from kicking open the doors of the 3,500 sq foot unit but we’ve just overfunded with the crowd by three times our expectation. We have signed on the dotted line to pick up a new 17,500 square foot home. We plan on building a fully functioning brewery that will deliver 4 times the current capacity. A tap room to end all tap rooms and the Continent is calling. Verdant is lush. Verdant is abundant, exuberant, riotous, prolific. 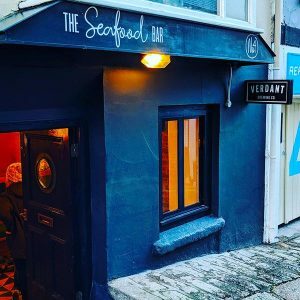 In addition, Verdant have now opened a Seafood Bar in the heart of Falmouth (pictured above). It’s well worth a visit, not only to experience some of the best beer’s they have ever made but also for the delicious Seafood tapas offering. So, from three hungry guys chasing a sausage sandwich to three very admirable, successful business owners with feet still firmly on the ground committed to making an exciting product that stays at the top of the industry rating and remains relevant to its massive audience. 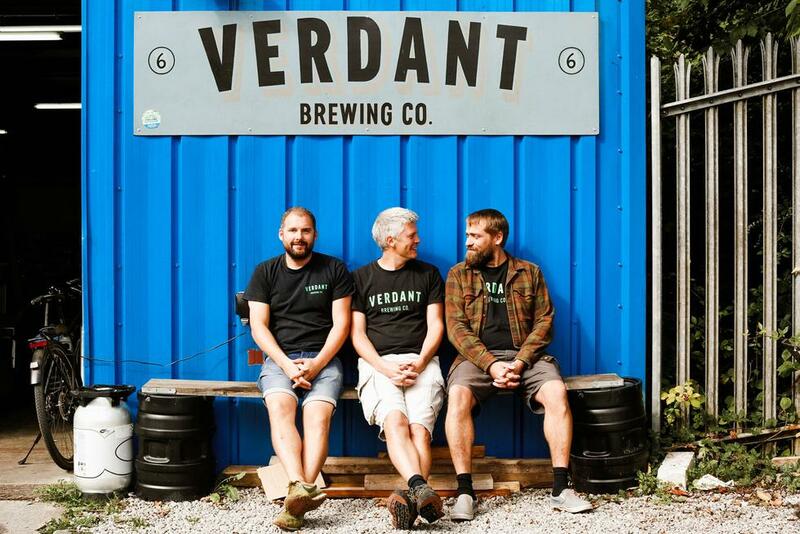 Click here find out exactly how Verdant made it happen, from business plans to obtaining investment to property negotiations.